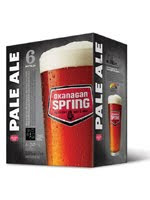 "Brewed by Okanagan Spring in 1989, this is BC's original and favourite Pale Ale. Clear and copper coloured, it is fruity on the palate and hearty in hops with a nice, round finish. We are honourd that Pale Ale continues to be BC's most popular craft brew." the Look: true copper colour, nice lingering head, lace on the glass but remaining on the pour as well. the Smell: not a big nose on this beer, light hoppy if anything. the Taste: lightly bitter from the hops, ironically it could be described as complex as there are a few flavours there, but still manages to be fairly light, not over powering. Overall: I enjoyed this brew on draft sitting in the shade on a patio. This is a beer with a nice colour, easy flavour, however, not quite the refreshing kick you hope for on a hot summer day. I'd save this for the early fall, crisp days/evenings, ideally relaxing around a campfire. I'd rank this beer a solid "B+".